It may have just been our imagination because these looked so different, but aided by the Kettle Cooking and perhaps the oil, these Chips seemed to have a superior crunch, to not just Utz's Regular Chips, but most of their Kettle Cooked Chips. Immediately, these Chips gain an extra mark because when it comes to texture you have to look for character. You cannot have much more character, when compared to peers, than a dark brown Natural Chip. Many looked particularly oil soaked but there was a good variety in size. We cannot say whether the flesh of these Chips were darker because the potatoes were stored for a long period, but it did not affect the taste. 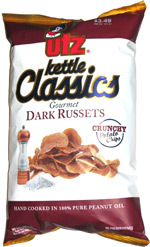 These Chips tasted very similar, if not the same, as the Utz Regular Chips. As they look a little different, they would make a good sandwich buddy. For us, the taste was a bit bland.